There are just a few carbon sequestration projects happening around the world, and this week Germany became the latest to test this experimental technology. Carbon sequestration takes the carbon dioxide (CO2) emissions from a power plant and sequesters them so they don't get released into the atmosphere and worsen global warming. Typically the CO2 is sequestered in rock underground or even swamps. The German project began pumping the CO2 into sandstone deposits this week, just outside of Berlin, near Ketzin. This first phase will continue through 2009 to determine whether sequestering the CO2 is safe. At the latest, the technology will be ready for market in 2020. The sequestration facility is being built by the European energy giant Vattenfall. 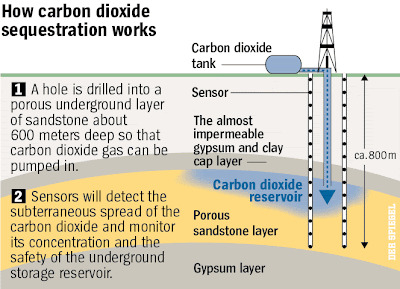 It will pump the CO2 2,600 feet below ground into a saline aquifer with porous sandstone. Safety concerns include leakage - if CO2 makes up just 8 percent of air volume, it can be deadly. However, many energy experts point out that we are so over-reliant on coal power - in the U.S., it makes up 50 percent of our energy - that it will have to continue to be part of our energy mix in the near future. Reconciling that reality with the global warming reality that demands we cut emissions deeply and quickly means that carbon sequestration is a technology that must be explored.